City Manager Tony Dahlerbruch position to terminate under new City Council? 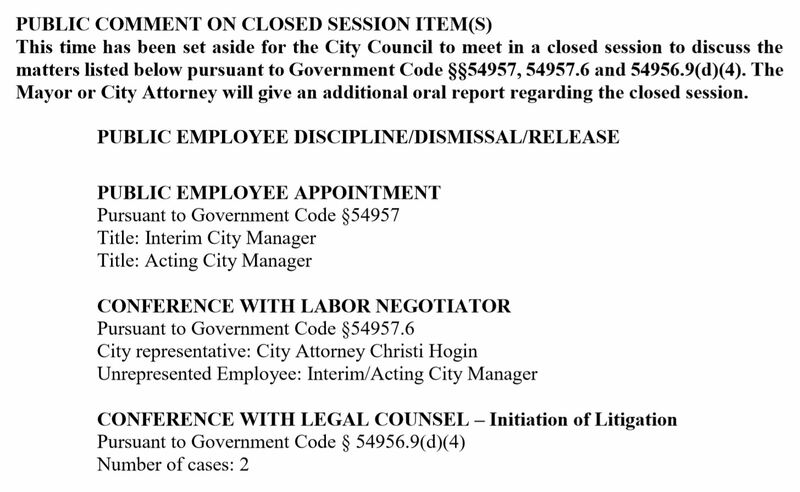 Based on the April 3, 2019 posting of the agenda for a Special Meeting of the recently reconstituted Palos Verdes Estates City Council (click here or on images), it appears that Tony Dahlerbruch's position as City Manager is about to terminate. ethical issues, including potentially making knowingly false statements. However, the formation of the Financial Advisory Committee (FAC) in 2018 seems to have been the beginning of the end of Dahlerbruch's checkered history as PVE's chief executive. This is because the FAC included or was attended by two very experienced financial service and accounting/audit executives, Victoria Lozzi and David McGowan. These two, in addition to the others on the FAC, reportedly got a "front row seat" on Dahlerbruch's perceived incompetence. This alone probably was enough to accelerate Dahlerbruch's demise. However, what happened next seems to have sealed his fate. Lozzi and McGowan were elected by PVE resident voters to the PVE City Council, which as a five-person entity is Dahlerbruch's "boss." It is reasonable to conclude that Dahlerbruch has seen the writing on the wall. 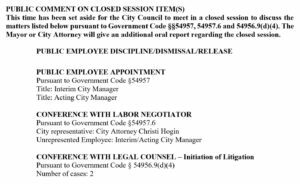 Reports are circulating that Dahlerbruch is actively seeking alternative employment (perhaps with the help of friend/City Attorney Christi Hogin, who along with her husband/Rolling Hills City Attorney Michael Jenkins reportedly assisted Dahlerbruch in obtaining the PVE City Manager job). 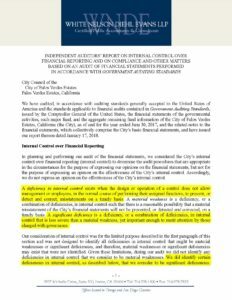 City Manager Tony Dahlerbruch found himself faced with a January 17, 2018 Auditor's report (click here) that stated, for the second year in a row, "We did identify certain deficiencies in internal control, as described below, that we consider to be significant deficiencies." (click on image below). City Mayor Vandever Determined to Hide Pension Bomb: Anyone wishing to confirm Mayor Jim Vandever's determination to mistreat PVE's pension liability as an illusion rather than money the City is highly likely to owe is steered toward his January 23, 2018 dialog with the Auditor's representative (click here at 1:07:00). To anyone with any finance training, it is astounding to listen to PVE's Auditor explain how PVE's restricted cash balance plummeted from $20 million to $10 million and then the Mayor's response. Auditor: "The one thing I really want to highlight is the big drop really was between 2014 and 2018 ... when the City had to implement ... pension standards ... that put $10 million of net pension liability into your books." Vandever (shockingly and defensively): "Our pension liability, what we really owe ... didn't change by a penny. This is just someone else's view of what that is likely to be in a future state." For the next few minutes, Vandever's brain either lacks the capacity or is unwilling to grasp that interest rates have plummeted globally toward zero percent. The Auditor explains that if the discount rate drops to 6.5% from the now lower 7.5% assumed discount rate, the pension liability would rise by another 50% overnight. That extraordinarily stark warning from the City's auditor received truly NO reaction or concern from the entire City Council, or Treasurer Lozzi for that matter. It was glossed over despite being tantamount to NOAA's meteorologist having just broadcast, "If the wind changes just 5 degrees to the south, Category 5 Hurricane Tony will hit PVE's coastline head on." City Manager Dahlerbruch Continues to Deceive, Delay and Deflect: Dahlerbruch expends the most energy during this meeting attempting to neuter, isolate and depower this committee and its sub-committees (watch from around 2:00:00 onward). However, throughout the meeting our City Manager either cannot or will not answer basic questions, including one regarding the "magnitude of pension prepayments" (click here at 57:00). Powerful FAC member David McGowan calls out Dahlerbruch for not having complied with "very simple task" of giving the FAC information on PVE government personnel quantity and reconciliation with past approved staffing plans (click here at 58:00 to 1:01:00). McGowan deserves kudos for not accepting Dahlerbruch's excuses for non-delivery, stating, "I don't understand 'as it becomes available'. It should be available as we sit here tonight." Immediately after failing to answer McGowan's "simple" question, City Manager Dahlerbruch shows a slide exhibiting the infeasible "Police Department Reductions" plan (click here at 1:01:00), which in addition to promising unattainable savings through theoretical 2-3-year attrition doesn't come anywhere close to the PVEPD cost increases from pension and insurance. Even worse, the second line item on this slide states, "Convert sworn Captain positions to civilian Manager position." Dahlerbruch failed to inform the FAC that not only had Captain Tony Best not converted his title in any fashion, but Mark Velez's briefly vacant captain position reportedly has been filled with Steve Eberhard's promotion to Acting Captain. Nobody with Courage to Confront PVEPD's Steady March of PVE Toward Bankruptcy: Despite City Manager Dahlerbruch making abundantly clear that PVE's operational and capital costs were set to rise (if not explode), not a soul in City Hall has the fortitude to request, much less demand, a Sheriff Feasibility Study (SFS). Pathetically, the most we've seen is a sheepish, nearly whispered mention in May 2018 by Treasurer Lozzi that a SFS would be nice to have (click here). Such a SFS would put to rest once and for all how much PVE would save and precisely what services would be obtained by PVE joining RPV, Rolling Hills and RHE in contracting the LASD. It is a near certainty that a "tax stack" ("Measure F") shall be arriving in PVE mailboxes in 2019. Without the long overdue SFS being completed and available to voters, again the City can be expected to make false statements misrepresenting the Sheriff's costs and benefits - all in order to get PVE homeowners to vote to tax their homes yet again. 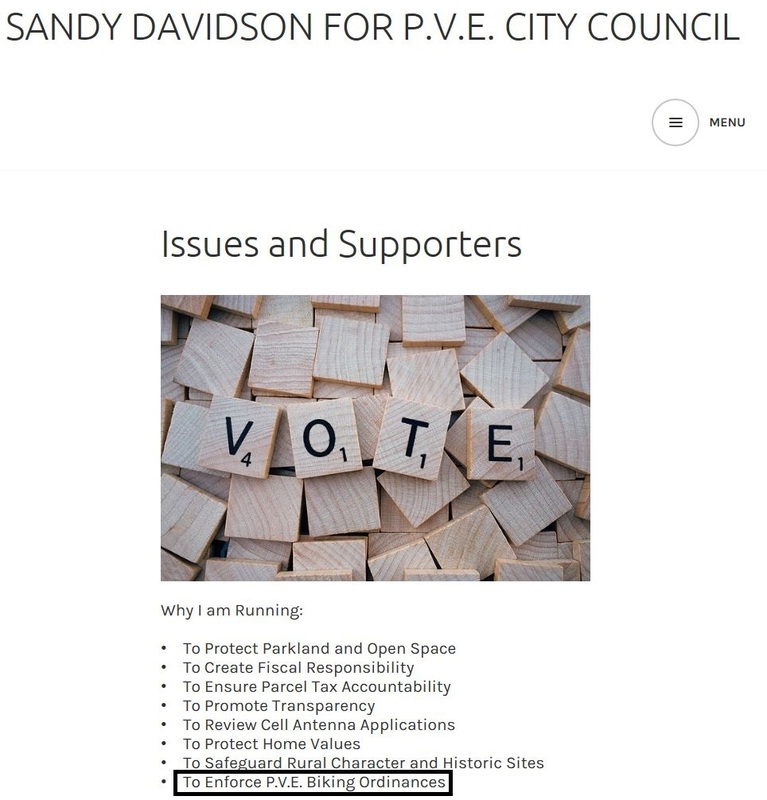 With Sandy Davidson present staring her down yet again, Treasurer Lozzi essentially confirmed precisely that of which she was accused by Davidson during his "Venom Speech" (click here). Despite the live microphone directly in front of her and the City Manager's abundant discussion about exploding costs and deficient revenues, Lozzi did not utter a single word about obtaining a Sheriff Feasibility Study. This SFS clearly is needed both as a baseline/benchmark to use in current PVEPD contract negotiations, and to inform voters ahead of the next tax vote. In fact, only Sandy Davidson made any substantive comments about his prized police source of a "way of life" in PVE. Everyone else was silent, as if the PVEPD wasn't consuming over half our strained budget or the Sheriff quote was not less than half of that same PVEPD budget. Former Mayor Jim Nyman's condemnation of selective and non-law enforcement by the PVEPD (click here at 32:10) typically has been entirely ignored by the City Council. Who on the FAC Truly Is Protecting the Taxpaying Residents? The only member of the FAC to challenge Dahlerbruch was David McGowan. He is the only member of the five to make clear his determination to model out a 5-10 year City budget, and that he is not going to let Dahlerbruch render ineffectual the FAC. Amy Forte appears to view her role as an administrator orchestrating the timing of slides and speakers. Ela Jhaveri is nearly invisible, while Don Culler (one of the leaders of the Save PVE Police Committee) frankly is operating at a pace that is difficult to track. Lastly and the biggest problem is Mark Young. Young appears to be a mere extension of Tony Dahlerbruch. He clearly was selected over others to be a friend of PVE City Hall and its councilpersons, particularly since for a living he gets contracts with City Halls around Los Angeles. He ended the April 19, 2018 meeting commenting on how PVE had "dodged a bullet" by passing the $5 million/year Measure E Parcel Tax: "The Sheriff were not going to be able to solve the problem." Given the PVEPD's $7.5 - $10 million (and rising) annual budget vs. our own City Manager quantifying the Sheriff cost at $3.5 - $4.5 million/year, how precisely wasn't up to $6.5 million/year in law enforcement savings (on an $18 million annual budget) a clear solution/alternative to a $5 million/year tax on our homes? 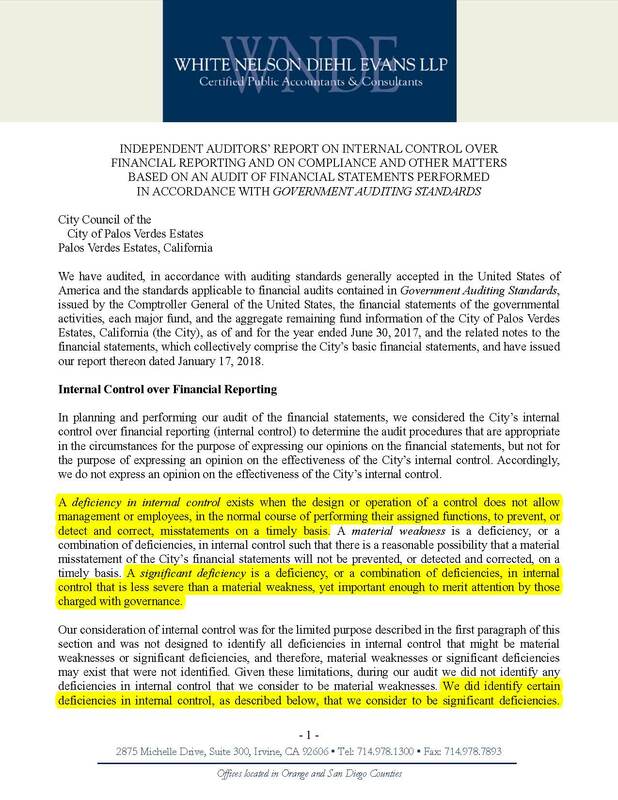 * Auditor's letter stated, "Our consideration of internal control was for the limited purpose described in the first paragraph of this section and was not designed to identify all deficiencies in internal control that might be material weaknesses or significant deficiencies, and therefore, material weaknesses or significant deficiencies may exist that were not identified." Obstructing Cyclists: Have you been stuck behind an illegal cyclist? Cycling traffic has come to PVE in full force. This is due in no small part to PVE's typically wide lanes, relatively few parked cars due to large driveways/garages, scenic beauty and clean air, and rolling hills that provide an excellent training ground for the climbing stage of competitive cycling events. However, illegal cyclist obstruction of motorist traffic is not just a matter of slowing down cars - it can be the catalyst to a sequence of reactions that leads to motorist fatalities (click here). 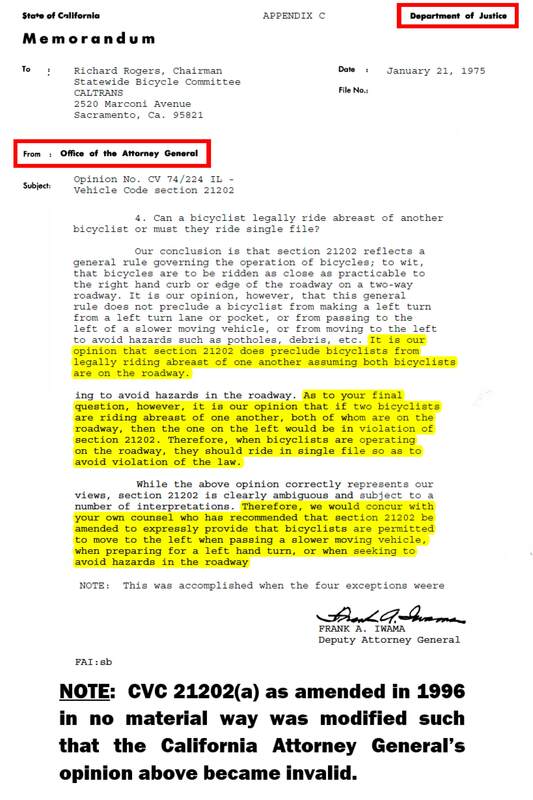 The Big Orange Cycling group, which shockingly was supported by PVE's Chief of Police despite its cyclists increasingly being identified as illegally riding side- by-side in violation of CVC 21202(a), unfortunately decided in mid-2016 that their best defense was to be offensive. Click here for a video representation of what occurred. 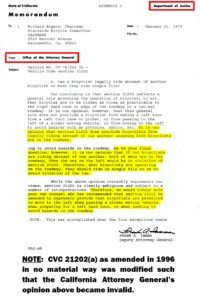 CVC 21202(a), as interpreted by the California Attorney General's office (see letter), makes clear that various cyclists blatantly and rampantly are breaking the law in PVE. 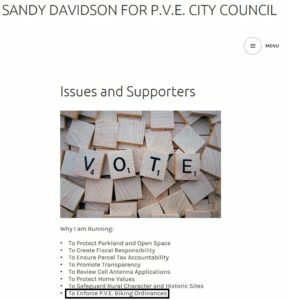 PVE voters who elected Sandy Davidson are still waiting for him to honor his pledge to obtain PVEPD enforcement of cycling laws. This website is amazing! I can say that everyone I know in PVE is so happy that Tony D has been dismissed. He built a reputation for obstructing progress in just about every form. Incompetence at its worst. Dishonesty at its most vile. I pity whoever hires this guy next. The turnover in PVE City Hall has been tremendous in just six years since Tony D came to town. This is just from memory. A lot of people have been poached by former PVE City Manager Joe Hoefgen who now runs Redondo as its City Manager. I’m sure I’ve missed a few. There was some guy named Reg or Reg who also was senior and has left. It’s been a debacle. It took this long to get this buffoon Dahlerbruch out of PVE????? What is wrong with this city? You’ve got Kepley, Repp-Loadsman, and Dahlerbruch all jammed out of town in just the past year. Why can’t the city council hire good people?